3. Select a course category that you are interested in booking, for example Swim Kids (5 to 12 years). Hereâ&#x20AC;&#x2122;s a snap shot of how you can easily register online. START HERE 1. Sign in at MyAirdrie.ca (if you donâ&#x20AC;&#x2122;t already have an account you will need to create one and enable the recreation panel in order to use the system). 4. Click Show courses to display available dates and times. Please h your cr ave edit ca rd inform at at the c ion ready heck o ut. Use filters to narrow results! 2. Click Register For Courses on the recreation and booking panel. 5. Select the course you want to enroll in and click Register. right hand corner of the course page. Complete to pay and confirm your registration. 7. Select attendee for course and click Next â&#x20AC;&#x201C; this registration could be for your family member or for yourself. You have the ability to Add Family Member at this point in the registration process. 10. Once your registration is complete and your payment has been accepted, you can Add to Calendar, Print Registration, Print Receipt or Register for more courses. 8. Click Checkout to complete your registration. If you would like to book another activity you can click book another event, or move onto completing your payment information. Welcome! 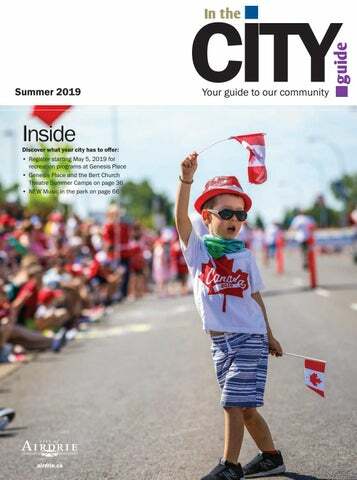 Welcome to the summer issue of the In the City Guide, a City of Airdrie publication. This is your guide to all that is Airdrie – from where to recycle household items to recreation programs offered at Genesis Place. In the City Guide is published three times a year by the City of Airdrie Corporate Communications department. Pick up a copy at magazine stands throughout Airdrie and surrounding communities. This publication was printed using recycled materials and can be recycled. 24 hour recreation registration, utility payments and assessment information, visit airdrie.ca or MyAirdrie.ca. Saturday and Sunday, 7 a.m. – 9 p.m.
Monday to Friday, 5:30 a.m. – 10 p.m.
Table of contents What’s in your neighbourhood? RS B ! Off-Leash Dog Park Í ® Post Office ! Aquatics area closes 30 minutes before the rest of the centre. See area schedules for specific details. Entrance for Public and Family Swim is not permitted until scheduled times, including entry into the locker rooms. 11 a.m. – 5 p.m. 11 a.m. – 5 p.m. Note: Genesis Place is host to special events that may affect regular business operation. 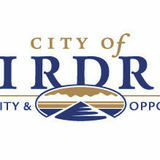 Visit www.airdrie.ca/GPclosures to stay up to date. 3 MONTH PASS Must be paid in full, pass can’t be cancelled. Expires 90 days from date of purchase. We’ve moved program schedules online! Actually, they’ve been there for a while now. In The City Guide is changing. You’ll still find all the great programs the City has to offer but date and price details for offerings like swimming lessons can be found at genesisplace.ca. Fees & passes – summer 2019 continued... Looking for wellness opportunities for your employees? Sign up and save! Did you know that organizations/companies can purchase a Corporate Annual Pass at a reduced rate if four or more employees purchase an annual pass at the same time? Gather up your fellow employees and each purchase a Corporate Annual Pass at Genesis Place. Note: In order to be eligible for the Corporate Annual Pass, companies must have at least four employees with active passes at all times. •	Payment must be made in full at time of purchase •	Employees are also eligible to upgrade their pass to include family members. Ask us how. Call 403.948.8804 ext. 5549 for more details or email recreation.wellness@airdrie.ca. What’s a kid-free workout worth? We provide safe and quality child care for less than $5! Summer Hours Monday to Friday from 8:15 a.m. to 1:15 p.m. 10, 20 and 50 hour passes available. Looking for a gift you know they’ll love? We’ve got you covered. Genesis Place gift cards let your special someone choose what their perfect gift looks like. Gifts cards can be used for all Genesis Place programs, services or passes! Available in any amount! Visit Customer Service to pick one up today! Lost or stolen gift cards cannot be replaced. Program Registration Program registration at 7 a.m.
All swimming program starting in August register on Sunday, July 7 at 7 a.m.
Visit gensisplace.ca to find out other great ways to stay in shape. Swimming Lessons Swimming pool •	To attend family swim, children must be with someone who is 18 years of age or older who is in the water with them at all times. •	Children under the age of eight must be accompanied by a person 14 years of age or older who is in the water in appropriate swim attire. •	Guardians/caregivers are required to wear clothing appropriate for swimming that has been brought to the pool for the intention of going in the water when supervising children under the age of eight. •	Guardians may only supervise up to four children under the age of eight. •	You must shower using soap before entering the pool. •	Please ensure that you bring indoor footwear as no outdoor shoes are permitted in the aquatic area. •	All children 35 months and under must wear a swim diaper PLUS a waterproof pant. •	You must be 42 inches tall to ride the slide; no double riding. •	Diving is only allowed in the dive tank. •	Lane swimmers – please be courteous and share lanes. •	Aquatic climbing wall – one climber at a time, experienced swimmers only. •	Strollers must be kept in the viewing area. Wheels must be cleaned before entering change rooms. •	Entrance for public and family swim is not permitted until the scheduled times, including entry into the locker rooms. Parent and Tot swim •	Admission accepted up to 30 minutes before the end of the parent and tot session time. •	Swimmers are asked to leave the aquatic area when time has ended. •	One adult free with paid preschool drop-in admission for newborns to children five years of age. Lessons •	Parents and related family members are given access to view the child’s swimming lessons only. Admission must be paid to use the pool. •	Not all classes will run during the summer (schedule is subject to change). •	Program details on genesisplace.ca. 8–level program for children ages four months to six years STARFISHAges 4 to 12 months •	Orientation to water for babies and their parent/caregiver. •	To enter this level, babies must be able to hold their head up. •	The goals are to help babies experience buoyancy and movement through songs and play in the water and to teach the parent/caregiver age specific water safety. DUCKAges 12 to 24 months •	Orientation to water for toddlers and their parent/caregiver. •	Swimmers learn how to use floating objects for support and explore different water movements through games, songs and active water play. The parent/caregiver also learns age specific water safety. SEA TURTLEAges 24 to 36 months •	Orientation to water for toddlers and their parent/caregiver. •	Swimmers learn, through fun games and songs, how to combine skills, how to kick with a buoyant object and how to perform basic floats, glides and kicks. SEA OTTERAges 3 to 5 years •	Transitional level that transfers the preschooler to the care of the instructor. Most of the skills are assisted by the instructor. •	Using games and activities, swimmers learn to open their eyes under water, further develop basic floats and glides, and swim one metre. They also learn age appropriate water safety skills. SALAMANDERAges 3 to 5 years •	Swimmers enter this level when they have successfully completed Sea Otter. •	Using games and activities, swimmers learn to swim two metres, further develop basic floats and increase their distance on front and back glides. Front swim and roll-over glides are also included, and swimmers learn appropriate water safety skills such as how to jump into chest-deep water and how to use a personal flotation device (PFD). •	Safety skills development includes water orientation, safe entries and exits and only swimming when an adult is present. SUNFISHAges 3 to 6 years •	Swimmers enter this level when they have successfully completed Salamander. •	Using games and activities, swimmers learn to swim five metres, increase their distance using buoyant objects, increase their front and back glides with kicks, and develop their roll-over glide, side glide and front swim. Safety skills include deep-water skills and use of a personal flotation device (PFD). •	Safety skills development such as water orientation, safe entries and exits and always asking for permission before going near the water. CROCODILEAges 3 to 6 years •	Swimmers enter this level when they have successfully completed Sunfish. •	Through games and other fun activities, swimmers learn to swim seven metres on their front and back, perform a dolphin kick and begin using rhythmic breathing. They also progress with kicking drills and increase their swimming distance to 10m. •	Safety skills include jumping into deep water and performing surface support for 10 seconds, recognizing when a swimmer needs help and using a Personal Flotation Device (PFD) in deep water. WHALE Ages 3 to 6 years •	Swimmers enter this level when they have successfully completed Crocodile. •	Through fun activities, swimmers perform a front and back swim for 10m. Swimmers work on developing their flutter kick and perform a distance swim of 15m. •	Safety skills include identifying safe swimming areas, jumping into deep water, swimming 5m, surface support for 20 seconds a return to safety, throwing assists and sitting dives. Check out genesisplace.ca for program information and to register. Important things to know •	Visit genesisplace.ca for program details and registration. •	Programs starting in July open for registration May 5, and programs starting in August open for registration July 7. •	Unsure of your level? Contact the Aquatic Programmer 403.948.8804 ext. 5507 for $10 swim assessment. •	Children can transfer to the Red Cross Swim Kids program at five years of age. Please see transfer chart on page 14. •	Hand in previous report card to swim instructors on the first day of class. •	At the midpoint of the session you may check with the instructor to ask questions about your child’s progress and skills. •	Swim lesson fees do not include the use of aquatic amenities before or after the scheduled lessons. •	All children under the age of eight years must be accompanied into the water at all times by a caregiver who is at least 14 years and within arm’s reach. This includes before and after swim lessons. •	Genesis Place reserves the right to cancel classes that do not fill to minimum requirements prior to program start dates. A 10 level program for children ages 5 to 12 years The 10 levels allow for solid progression. Children learn competitive and survival strokes and build their distance and speed while focusing on making safe decisions in, on and around the water. In each level, participants are evaluated based on performance criteria and progress to the next level once all of the criteria have been successfully completed. Swimmers receive an orientation to water and the pool area and work on floats, glides and kicking. Swimmers build their endurance by working on the five metre front swim. Swimmers work on propulsion skills to move through the water and to remain at the surface. Swimmers work on the front swim (5m) and learn about deep-water activities and proper use of a personal flotation device (PFD). Fitness activities include the 10m flutter kick and a 10m distance swim. This level provides an introduction to diving and teaches swimmers how to make wise choices about where and when to swim. Endurance is achieved by building strength in the flutter kick and a 15m swim. This level introduces the front crawl (10m) and back swim with shoulder roll (15m). Swimmers work on kneeling dives, surface support (45 seconds, deep water) and developing a greater sense of self-safety by understanding their own limits. Endurance is built through a 25m swim. This level introduces the back crawl (15m), sculling skills, whip kick on the back, stride dives and treading water. Front crawl increases to 15m. An introduction to safe boating skills is also included. Endurance is developed through a 50m swim. This level refines front crawl with a focus on hand entry and breathing (25m), back crawl with a focus on arm positions and body roll (25m), introduces elementary backstroke (15m), safety on ice and rescue of others with throwing assists. Swimmers demonstrate the front dive and their ability to tread water in deep water for one and a half minutes. Endurance is built through dolphin kick and a 75m swim. This level builds skills and endurance for the front crawl (50m), back crawl (50m), elementary backstroke (25m) and introduces whip kick on the front. Swimmers learn about airway and breathing obstructions, reaching assists and stride entry. Swimming endurance is increased to a 150m swim. This level is an introduction to breaststroke (15m) and feet-first surface dives. Swimmers learn about the dangers of open water, hypothermia, the performance of rescue breathing on children and adults and standing shallow dives. Swimmers participate in timed treading water activities using the eggbeater kick for three minutes to improve their ability to remain at the surface in the event of an unexpected fall into water. Endurance is built on a 300m swim. Front crawl and back crawl distances are increased to 75m each. This level reviews the front crawl (100m), back crawl (100m), elementary backstroke (50m), breaststroke (25m) and encourages swimmers to combine different kicks for fitness (three minutes). They also work on head-first surface dives and learn about wise choices, peer influences and self-rescue from ice. Endurance is built through a 400m swim. This level is a final assessment of the strokes for technique and distance (front crawl 100m, back crawl 100m, elementary backstroke 50m, breaststroke 50m and sidestroke 25m). Swimmers learn about sun safety, rescue of others from ice, and head-first and feet-first surface dives. Endurance is built using the dolphin kick (vertical) and a 500m swim. Increase your comfort and confidence in the water through floats, glides, kicking, front crawl, back crawl and establishing comfort in deep water. Work with your Water Safety Instructor to set goals to develop your swimming skills. Red Cross Swim Strokes is to develop one or more swimming strokes, working towards proficiency and increasing endurance. Work with your Water Safety Instructor to choose the strokes and set your goals and priorities. If you are interested in developing your strokes so that you can train for a triathlon, this is the ideal course for you. Certifications Genesis Place is an authorized training partner in delivering Red Cross and Lifesaving Society water safety programs and certification. Instructors are certified Red Cross and Canadian Lifesaving Society trainers and offer many certification courses throughout the year. Find the course thatâ&#x20AC;&#x2122;s right for you and sign-up today. Visit genesisplace.ca for registration information. Minimum registration numbers must be met one week prior to start date in order for courses to run. These courses are offered at Genesis Place. To register, go to genesisplace.ca, call 403.948.8804 or come in to Customer Service. Optional lifeguarding courses Junior Lifeguard Club Ages 8 to 12 Junior Lifeguard Club is an optional course that provides an opportunity to further develop swimming skills, lifesaving skills and knowledge and engages youth in working with others. This course also provides an introduction to future aquatic certification courses. Prerequisite: ability to swim a minimum of 25m continuously and tread water for 2 minutes. Swim Patrol Ages 8 to 12 The Canadian Swim Patrol program provides enriched training for those who are ready to go beyond learn-to-swim. Swim Patrol has three levels: Rookie, Ranger and Star. These programs continue to develop participantsâ&#x20AC;&#x2122; swim strokes and provide the skill foundation that prepares them for success in the Societyâ&#x20AC;&#x2122;s Bronze Medal awards. Each level of the Canadian Swim Patrol program has three modules: Water Proficiency, First Aid and Recognition & Rescue. Bronze Star Ages 8 to 12 Bronze Star is an excellent preparation for success in Bronze Medallion. In Bronze Star, participants develop problem-solving and decision-making skills as individuals and with partners. They learn CPR and develop water smart confidence and the lifesaving skills needed to be their own personal lifeguard. Includes CPR A and AED. Water Safety Instructor – Online The online component of the course focuses on the theory of instruction. Candidate’s knowledge is tested through videos, virtual games, workbook and online activities and a knowledge evaluation at the end of each module. Online will take approximately 14 – 20 hours to complete. Please contact the programmer at 403.948.8804 ext. 5507 to purchase materials and gain online access. Water Safety Instructor Teaching â&#x20AC;&#x201C; Experience Candidates complete a minimum amount of hours of teaching experience (with 100% attendance and participation, including assisting a Supervising WSI in the water). Please contact the programmer at 403.948.8804 ext. 5507 to get more details and set up co-teach dates. Ages 11+ Offers basic first aid and caregiving skills for youth 11 years and older. Participants learn how to provide care to children in a variety of age groups and how to prevent and respond to emergencies. The course also offers youth the skills to promote themselves as babysitters to prospective families. Check out www.airdrie.ca/certifications for more information. First Aid, CPR for individuals and groups Genesis Place offers Standard First Aid and CPR Level C for ages 11+. This is an occupational health and safety approved first aid course. First Aid group training Looking for a First Aid course for a group or business? Need something recognized by OHS? Weâ&#x20AC;&#x2122;ll provide the space and instructor â&#x20AC;&#x201C; you provide the people! Check out www.airdrie.ca/certifications for more information. Develop healthy habits while having fun and getting fit at Genesis Place! be able to hop before you can skip or balance before you can kick? Our fitness and leisure programs focus on developing early physical literacy skills that will encourage you down a path to an active lifestyle. Growing the whole person The preschool where kids develop healthy habits that last a lifetime. Your child will not only master their ABCs and 123s but also the building blocks of movement. As a bonus, while your child is having fun in a safe place, learning to play with others, you can enjoy the many great amenities Genesis Place has to offer! Check out www.airdrie.ca/kidsconnection for registration information. •	Parent and tot (16 to 24 months) •	Coach and child multi-sport (ages 2 to 3) •	Coach and child multi-sport (ages 3 to 5) •	Parent and child indoor/oudoor soccer (ages 2 to 3) •	Coach and child indoor/outdoor soccer (ages 3 to 6) Visit www.airdrie.ca/sportball for more information. Remember your lock and save $2 Locks are available to rent for $2, but if you rented one each time, the costs could really add up. It pays to pack a lock. Monday to Friday 1:30 to 3:30 p.m. Entry is included for passholders, drop-in fees apply for non-passholders. 4:30–5:30 p.m. 4:30–5:30 p.m. 2–3 p.m. Cost included with all Genesis Place passes or regular drop-in fees. Watch for family events throughout the year! Please note! You can also drop-in and use the Fitness Centre, check out the new age guidelines on page 30. Entry is free for passholders, drop-in fees apply for non-passholders. f our five pools and don â&#x20AC;&#x2122;t miss the waterslide, div ing board, aquatic wall, swin ging rope or steam room. while youâ&#x20AC;&#x2122;re here, Drop-in at the gym to play games, shoot some hoops or get a rally going! Adult fitness services Orientation Free: Apple Fitness Centre orientation Join our weight room representatives for this complimentary general fitness facility and equipment orientation. All orientations include a demonstration on the proper use of the equipment, weight room etiquette and proper equipment safety. Please see the Customer Service desk for more information. Fitness Assessment Free: Fitness profile Are you meeting your fitness goals? How is your current fitness program contributing to your overall health? A Genesis Place certified personal trainer can provide some insight into your current health and well-being with this complimentary one-on-one session. Did you know All of our trainers hold a minimum two year diploma or a Bachelor’s Degree in Kinesiology or Sports Medicine; our trainers also have one or more certifications through the following organizations: Canadian Society of Exercise Physiology, National Strength and Conditioning Association and Alberta Fitness and Leadership Certification Association. Important things to know: •	Prices include GST. •	Each session will be 45 minutes in length. •	Personal training packages expire one year from date of purchase. •	Personal training sessions can be purchased online. •	Call 403.948.8804 ext. 5518 or email personal.training@airdrie.ca to book a personal trainer. Dry land drop-in classes Drop-in classes are open to individuals age 13 and up. Youth ages 13 to 15 must be accompanied by an adult in the class. Drop-in fitness classes are open to all ability levels and can provide a fun and challenging way to meet your fitness goals. Please see in-house flyers or visit genesisplace.ca for current schedules. This older adult class will keep your body guessing! Everything from Cardio Drumming, Zumba™ Gold, modified intervals and we can’t forget about strength-based exercises. Join us for a fun and empowering class focusing on postural strength and alignment. Using light weights, you are sure to sculpt the upper and lower body, abs and increase flexibility. Incorporate weights and other equipment into your Barre routine, allowing greater options for an optimal workout! Strengthen your bones and prevent fall-related injuries in this strength, core and balance class. This muscle conditioning class will sculpt and shape your body. The instructor will incorporate a variety of equipment to help burn fat and build lean muscle. Investigate this high energy class where your overall fitness level will be challenged with cardio drills, strength, endurance and balance training. Using compound movements you will increase your heart rate and work up a sweat without the need for cardiovascular training. Did you know Our fitness instructors are certified with the Alberta Fitness Leadership Certification Association (AFLCA) or Canfitpro with a variety of format designations. Our Yoga instructors hold a minimun of 200 hour yoga teacher training certification. Come get your fitness on as a family! Attend this drop-in family fitness class with your children ages 6+. Formats will be adaptable to all ages and all fitness levels. Children ages 6+ must be accompanied by an adult. This is a balanced class which links yoga postures together. The focus is on connecting the breath with the movements. This class will allow you to build strength, flexibility, balance and stamina as you explore the depths of your practice. This drop-in class is designed for individuals of all levels. It uses a series of gentle stretching poses, breath awareness and relaxation. No experience required. This hour of power pairs dynamic music and a motivating group atmosphere to get your heart rate up, make you sweat and push you to a personal best! Combining traditional strength exercises with barbells, weight plates and your own body weight, you will be fitter, stronger and one step closer towards reaching your goals. This class is suited to all levels and is designed to help improve flexibility, strength and balance through gentle yoga poses and breath awareness. This Pilates based class will use power Pilates and power yoga with weights, balls, elastic bands, and gliders (all optional) to target and shape specific muscles. This low-impact, full body workout improves muscle memory, decreases back pain and aligns posture. PiYo® combines the muscle-sculpting, core-firming benefits of Pilates with the strength and flexibility advantages of yoga. Cranking up the speed we deliver a true fat-burning, low-impact workout that leaves your body looking long, lean, and incredibly defined. Enjoy gentle, supported poses focusing on the spine, hips and shoulders. Take time to unravel hidden tensions in the mind and body. This class will focus on stretching, aerobics, strength training and balance. It will improve flexibility, muscle and bone strength, circulation, heart health and stability. It’s never too late to start! Straight-up Step is a full hour of step cardio. Challenge your strength and endurance in this classic format. STRONG by Zumba™ is a High Intensity Interval Training class using more traditional fitness moves for a more athletic, conditioning-style workout. This class is great for all levels. A high energy cardio workout with a mix of hills, sprints and intervals will leave you energized and drenched in sweat. This high intensity workout gives you the ability to utilize our track as well as our indoor cycling bikes and push your endurance to the max! Adding in strength based intervals you are sure to get the calorie blasting workout your body needs! Calling adults of all abilities. Do you tire easily with physical activity? Join this group workout led by a personal trainer to help improve functional independence. This class gives you an opportunity to meet our highly certified Fitness team and experience what each of them have to offer! Have a chance to participate in PiYo, CSI, Barre, Explosive Strength and many more formats that our facility offers. Join the latest fitness craze with our certified Zumba™ instructor. Latin music is fused with easy to follow dance moves that provide a calorie burning and body energizing class. Drop-in classes are open to individuals age 13 and up. Youth ages 13 to 15 must be accompanied by an adult in the class. Aqua yoga is a gentle and very low impact aquatic activity. This program takes principles and movements of yoga and adapts them to the water. With the release of gravity, the body is able to find the optimum stretch and by using the rhythm of the breath, an inner sense of relaxation can be achieved. Do you want to burn fat, increase strength, and improve your cardiovascular endurance? This class is recommended for those who want to work hard and talk later. This is appropriate for all swimming levels and takes place in waist to chest deep water. Deep Water Workout is a water fitness class incorporating the buoyancy and resistance of water to challenge your cardiovascular system and muscle groups by using intervals and endurance training. The exercises are done while wearing a flotation belt in deep water. Swimming skills are not necessary. Did you know We offer over 10+ water drop-in classes per week in a variety of formats. Not all classes described are available during the current session. This 45 minute aquatic fitness class will be held in the deep end of the leisure pool and is designed to provide opportunity for those who cannot withstand the temperature or the intensity of Deep Water Workout classes. This class will be ideal for participants looking to focus more on range of motion as movements and alignment. Let’s take boot camp to the water! Maximize the properties of water combined with strength, endurance and agility training to challenge your body to the next level in this high intensity H20 Boot Camp. This class is performed in deep water with the use of a flotation belt. Want to stay young at heart? This aquatic fitness class is for the 50+ enthusiast. Use water resistance to improve your cardio, strength and flexibility. This class takes place in waist to chest deep water. A shallow water fitness class that includes circuit training to challenge your cardiovascular system and all muscles groups. This class maximizes your body’s ability to work by utilizing the principles of water, as well as different types of equipment. Older adult fitness programs Physical activity is very important to your overall health, well-being and quality of life. Every step counts! Adding any amount of exercise can provide some health benefits. Regular exercise maintains strength and flexibility, balance and coordination and can help reduce the risk of falls. What to do at Genesis Place: Dry land and aquatic drop-in fitness programs (see pg. 36 – 38 for more details) •	Active Older Adult Variety •	Sit and Be Fit •	Fit over 50 H20 •	Bone Builders •	Aqua yoga Senior (65+)/Veteran facility fees & passes •	Gentle Deepwater Workout (Veteran status identification must be provided). •	Triple A *See our online schedule for Drop-in 10 time Monthly Annual Corporate more info at www.airdrie.ca/ $7.00 $62.70 $53.00 $405.70 $324.55 GPschedules Drop-in pickleball Tuesday 8:30 a.m. – 11:30 a.m. Wednesday 1 – 3 p.m. Thursday 8:30 – 11:30 a.m. Subsidy program offered (Airdrie Participant Support Program). Call Community Links at 403.945.3900 or for more information visit www.airdrie.ca/apsp. Included in Genesis Place passes or regular drop-in fees apply. For more information about older adult programs offered at Genesis Place please contact 403.948.8804 ext. 5518. Iced Coffee Brew Crew Come and enjoy some complimentary coffee in the Fitness Centre lobby and get to know the Genesis Place wellness experts. First Tuesday of every month from 9 – 10 a.m.
A supervised group exercise program consisting of structured and planned activities which are developed and monitored by health care professionals (Kinesiologist and Physiotherapist) adapted to meet the needs of clients with a variety of chronic conditions. Chronic conditions include heart disease, diabetes, high blood pressure, arthritis, chronic lung disease or other long term medical conditions. This is a 10 week program. Call 403.943.2584 to register. Monday and Wednesday 10:30 a.m. – 12 p.m.
Self-management workshop Better Choices, Better Health™ People with any chronic condition take part in a six week 2.5 hr workshop. They share ideas and learn the skills they need to live successfully with their conditions. The free workshops are led by trained leaders. Alberta Cancer and Exercise Program (ACE) ARE YOU CURRENTLY UNDERGOING OR HAVE COMPLETED CANCER TREATMENT? The ACE initiative aims to improve the quality of life for individuals living with cancer. This 12 week physical activity program is open to all cancer survivors within three years of completing treatment, capable of low to moderate intensity exercise and over the age of 18. To register for this program you must complete pre-screening through the Health & Wellness Lab at University of Calgary prior to the program start date. Please call 403.210.8482 or email ace@ucalgary.ca for a pre-screening. This includes two 60 minute classes each week, combining aerobic activity and strength training. For more information about the program, contact personal.training@airdrie.ca or call 403.948.8804 ext 5518. Genesis Place party packages Come and join us for a fantastic birthday party experience! Our trained leaders will take your child through a themed birthday party of your choice, before using one of our rooms to enjoy cake and presents. The following information applies to all themed birthday party packages: •	A host is provided to support and guide you through your birthday party, as well as assist with room set up and clean up. •	For themed parties aged 3 to 7 the leader ratio is 1:8 children. For themed parties aged eight and older, the leader ratio is 1:12 children. Fee for extra leader is $15. •	All birthday party packages are a total of two hours. •	One hour instructor led activities in dance studio or gym. •	One hour rental of a room for cake and presents. •	Room choices are either the Fun Place or the Bluegrass Nursery/ Woodmont Multipurpose Room. •	Food and decorations are the responsibility of the renter. •	GST not included in any of the party packages. For information or booking requests, please visit genesisplace.ca to fill out an online birthday party request form. We suggest a minimum of seven to eight weeks booking notice to host your party and it is subject to leader and room availability. Only need a room for your party? Contact us and we will do our best to accommodate your request. For birthday parties and Fun Place rentals please call 403.948.8804 ext 5519 or email party.enquiries@airdrie.ca. Bluegrass Nursery/ Woodmont Multi-purpose Room $32.45 per hour Great space for arts, crafts and more! Fun Place $43.25 per hour Our most popular space for birthdays! It’s your party so let’s celebrate! LET’S DANCE! This party is for everyone who wants to move and groove to the music. Instruments, creative movement and party dances make this a fast paced, fun, move to your own beat party. (Fees do not include GST). Come and enjoy an hour packed with tons of games in the gym that will make this a fun filled party for your child. Choose from a variety of instructorled activities, parachute games and scooter board races. (Fees do not include GST). Come and enjoy an hour packed with sports ranging from soccer, floor hockey, basketball and dodgeball. Choose your favourite sport or pick more than one! (Fees do not include GST). Do you and your friends love to clown around? This laugh-packed party will leave your guests splitting at the seams. Explore your silly side through improv, character creation and non-stop goofy games like “Who’s Line is it Anyway?” (Fees do not include GST). Kids love epic adventure, danger, heroes and villains. Even more, they love to direct and star in their own story. This incredible fairy tale extravaganza allows guests to guide plot twists which all lead to a happily ever after. (Fees do not include GST). Puppets, puppets and more puppets. Guests will imagine, construct and use their own puppets in a play of their creation. It’s the ultimate in imagination, and the puppet goes home with your guests so they never forget this fun-filled day. (Fees do not include GST). Comic strips are so much fun. Channel your love for art and story-telling and tap into your unlimited imagination to create a “funny” that will leave your fellow guests in stitches even after the party is over. Yes, that’s right the cartoons will be compiled and each guest goes home with ALL of the comics. (Fees do not include GST). An icon in Airdrie, the Bert Church LIVE Theatre has so much to offer and the 2019/2020 season will be one to remember. With live music, theatre, comedy, family shows, dance performances and more there is virtually something for everyone! Whatâ&#x20AC;&#x2122;s better, there isnâ&#x20AC;&#x2122;t a bad seat in the house, parking is ample and free and the sound and lighting is awesome. Grab a beverage and a treat in the lobby and enjoy before and during the show! Watch for show information and more at thebertchurchtheatre.com! Facility rentals Looking for a great place to host your next meeting, social gathering or event? Whatever your needs may be, we have the space for you! To help us serve you better when completing an online facility rental booking, please be prepared to answer the following: •	Full contact information (organization/group name, contact name, phone number and mailing address including postal code) •	Event details (type of event, number of participants and equipment required) •	Date and time requested (start and finish) •	Alternative dates and times that may work •	Any event set up requirements (banquet style, theatre style or classroom style) Please note: some rental space bookings will ask you for current liability insurance. GST is not included in hourly rate (fees subject to change). Visit www.airdrie.ca/facilityrentals for details on booking a rental space. To book rental space, email rentals@airdrie.ca. The Bert Church LIVE Theatre The Bert Church LIVE Theatre is a multipurpose facility suitable for a variety of activities. •	The Theatre seats up to 377 people and is great for rehearsals, concerts, weddings and more. •	The multipurpose room and lobby are great options for board meetings, workshops, receptions, fundraising events and more. Visit www.airdrie.ca/facilityrentals for booking requests and pricing. Need more information? To view available ice and dry pad times, visit www.airdrie.ca/arenas and choose the quick link Arena availability calendar. To book the ice or dry pad, call 403.948.8804 ext. 5527 or email rentals@airdrie.ca. Located in Fletcher Park at the north end of Airdrie (southwest of Main Street and 6 Avenue NW), Airdrie BMX offers racing for all ages. For more information visit airdriebmx.com or call 403.912.2012. Gwacheon Park Located in the heart of Airdrie, Gwacheon Park was named after our sister city Gwacheon, Korea. The park features six handcrafted totem poles that were donated to the City of Airdrie by Gwacheon Korea to commemorate the 10th year of sharing a sister city relationship. The park is located at 1701 Main Street SW. Nose Creek Valley Museum Nose Creek Valley Museum represents over 100 years of local history, providing an interesting glimpse into the historical aspects of Airdrie and surrounding area. Nose Creek Valley Museum is also home to Airdrie’s Tourist Bureau and is located at 1701 Main Street SW, at the south end of Nose Creek Park. Ball diamonds Airdrie has 23 baseball diamonds. Please contact the City of Airdrie Parks department at 403.948.8400 or visit airdrie.ca for more information and to ensure your event does not interrupt scheduled league play. Fire pits All fire pits and picnic shelters are available FREE of charge (with reservation) thanks to the contributions from local business, the City of Airdrie and the Scout Groups. For availability call the City of Airdrie Parks department at 403.948.8400. Picnic shelters are available at: •	Nose Creek Park – 1691 Main Street S The 3rd Airdrie Scout’s large fire pit is located northwest of the playground. Benches seat 60 – 70 people. •	East Lake Park – East Lake Road The 2nd Airdrie Scout’s large fire pit is located beside the Scout Hall. Benches seat 20 – 30 people. Airdrie Curling Club 102 – 275 Jensen Drive NE The Airdrie Curling Club is a recreational, family and competitive curling club that operates from October to March. Ice rentals are available and a pro shop is located at the rink. For more information visit airdriecurlingclub.ca. Visit nosecreekvalleymuseum.com or call 403.948.6685 for more information. Airdrie’s 18 hole golf course provides one of the longest regulation golf seasons in the Calgary area with some of the best course conditions. Tee times may be booked 24 hours a day, seven days a week online at woodsidegc.com or by calling 403.686.4653. The golf course is located at 525 Woodside Drive NW. There are 50 soccer/athletic fields located in various areas around the city. The fields can be booked by contacting the City of Airdrie Parks department at 403.948.8400 or visit airdrie.ca. The City of Aridrie has four pickleball courts for public use located at Nose Creen Park on a first come, first serve basis. helloneighbour :) New look. Slightly new prices. To continue providing Airdrie residents excellent transit service, some of our rates will be receiving minor adjustments effective July 1, 2019. Check out airdrietransit.ca for details. This map is the property of the C ity of Airdrie and may not be reproduced, in whole or in part, in any form or by any means without the written permission of the City of Airdrie. The map is for informational purposes only and should not be relied upon. The City does not warrant that the map is correct, complete, accurate, up-to-date or otherwise reliable. Use of the map is entirely at the user's own risk. Under no circumstances shall the City be liable for any damages arising from the use of the map. Big Springs Pathway south of the cemetery to Spring Haven Crescent SE – fenced area between residential area and QEII. King’s Heights Sharp Hill Way SE and Kingsview Road SE. Summerhill South of 3 Avenue SE to Sandstone Crescent SE – fenced area between residential area and QEII. Nose Creek Park Parking lot near the railway tracks. Parking is available just past Nose Creek Valley Museum on the left hand side. Off-leash education programs held at The Place 4 Paws throughout the summer. Check www.airdrie.ca/offleash for information. Responsible pet ownership The City of Airdrie has an Animal Control Bylaw No. B-33/2016 outlining the responsibilities of animal ownership. This is a brief overview of the Bylaw. Animal licencing Own a cat or dog? You are required to purchase an animal licence when your dog or cat is three months old. This licence is valid for one year from the date of purchase, and will help ensure you are reunited with your pet if they are lost. Renewals are mailed out one year after the date of purchase and every consecutive year after. Animal licences can be purchased online .ca or in person through at City Hall (400 Main Street SE) or the Municipal Police Building (2 Highland Park Way NE). Online entries are automatically submitted for a chance to win a Genesis Place family pass. When you count yourself in, your city receives $325 in Federal and Provincial grant dollars. Grants support roads, policing, social programs and other city services. Summer Reading Airdrie Public Library cards Program are now FREE! TD Summer Reading Club – Drop by the library for the TD Summer Reading Club: Natural World. You could win a literacy prize pack! Date TBA. Drop-in preschool literacy programs Rhymes & Songs (for children ages birth to 5 and their caregivers) – A fun filled program of finger plays, rhymes and songs. Summer Stories in the Park – Join us in the park this summer! APL will be visiting different parks around Airdrie for songs, stories, and so much more. Babytime (for children 12 months and under) – This is an oral program shared by caregiver and baby using rhymes, actions, songs and board books. Wild Wednesdays (for infants and children ages 5+ years) – This is a drop-in themed story time for infants and children up to age 5 and their caregivers. TD Summer Reading Club – Starts on Monday, July 2. The TD Summer Reading Club Finale will be in August. Date TBA. Free Family Fun Sunday Cinema – Come to the library for a FREE movie on Sunday May 19 and June 16! Special Events at APL Canada Day Barbecue – July 1 Join us for food and entertainment. Youth programs APL – has several youth-focused programs that run throughout the summer including an Open Mic night, a Teen Craft night and ART Saturdays! Check our website for further details. Adult programs Your Digital Library – One-to-One Technology Help. Need assistance with technology? Book a 45 minute appointment with one of our knowledgeable technology tutors. Adult Clubs – Monthly and weekly clubs for a wide range of interests, including books, writing, Scrabble, chess and knitting. Stories for the Tall – A weekly drop-in program for adults with disabilities and their aides or caregivers. Remember, your library card is FREE! Want to stay on top of what’s going on @ your library? Check our website for dates, times and other program and service information. Follow us on Twitter or Facebook! Search for AirdrieLibrary or click on the links from our homepage and start following us today! •	Free computer use, Wi-Fi connection and Internet access. •	3D Printing is available. Contact us for details. •	Multimedia Station with Creative Cloud. •	Access to all Alberta Public Libraries through melibraries.ca. •	Enjoy the library from home: download audiobooks, e-books, e-magazines, e-newspapers, music and movies/TV shows. •	New to Airdrie? Come see us and connect to your community. 111, 304 Main Street SE Airdrie, AB T4B 3C3 403.948.0600 Visit airdriepubliclibray.ca for dates, times and other program and service information. 9 a.m. – 8:30 p.m. 10 a.m. – 5 p.m. 1 – 5 p.m.
Closed on Sundays from July 7 to Sept. 1. Closed on statutory holidays. Caring for our natural environments Weeds thrive on maintained and manicured grass because they have access to moisture and light. Mowing only cuts the tops off the weeds, leaving the roots intact, which allows them to grow back and continue to spread. Healthy, thriving native vegetation outcompetes weeds by using moisture and creating shade. Allowing natural vegetation to establish itself will help eliminate weeds. The City of Airdrie monitors natural areas and naturalized landscapes for weeds and pests and applies control where necessary. Did you know mowing grass and dumping material on City property contravene our City’s bylaws? Can you spot the duck nest? Please be careful in our natural areas. Not all birds nest in trees. Don’t mow City property and stay on the pathways to help birds and other wild animals live safely. new Waterworks Bylaw The new Bylaw includes water restrictions that would only come into effect during a water shortage. Water shortages are classified into levels, which would trigger different types of restrictions. is status quo, the water schedule in level one is in place whether or not thereâ&#x20AC;&#x2122;s a water shortage. water shortage would be declared in times of drought, emergency (like the floods in 2013), distribution issues or infrastructure failure. water shortage would be declared if Airdrie was facing serious challenges in providing sufficient water supply. This would usually affect a wider area than Airdrie. The Bylaw includes a year-round watering schedule. 12 a.m. 1 a.m. 2 a.m. 3 a.m. 4 a.m. 5 a.m. 6 a.m. 7 a.m. 8 a.m. 9 a.m. 10 a.m. 11 a.m. 12 p.m. 1 p.m. 2 p.m. 3 p.m. 4 p.m. 5 p.m. 6 p.m. 7 p.m. 8 p.m. 9 p.m. 10 p.m. 11 p.m.
No watering on Fridays gives reservoirs a chance to replenish in preparation for the weekend, which is when the City experiences the highest demand. Visit www.airdrie.ca/waterconservation for more info. Material must be placed at the curb/alley by 7 a.m. on your collection day. •	Collected once weekly year round on the business day following your garbage and organics collection day. Cart placement is the main reason collection is missed. Leave a minimum of one metre clearance around the entire cart to ensure trucks are able to access it. •	Do not place excess recycling next to your recycling cart. The recycling collection trucks are automated and equipped to pick up carts only and not excess recycling around it. If you have excess recycling, hold onto it for the next collection day or take it to the Recycle Depot. The City hopes that by accepting pet waste in the organics carts, more waste will be kept out of the landfill. a free text or email reminder for your waste, recycling and organics collection days. Oct. 1 – April 30 Monday to Saturday 8 a.m. – 4 p.m. CLOSED Sunday and statutory holidays. Reminders •	Windy days make for wandering carts – write your address in the white block on your blue and green cart so it’s easy to identify if the wind moves it. •	Moving? Please leave your carts behind. They are City of Airdrie property and are assigned to that address. •	Damaged cart? Call Waste & Recycling to discuss options to repair or replace it. Place all recycling in the cart loose except shredded paper and plastic bags/stretchy plastic. Plastic containers with the recycling symbols #1—7 excluding polystyrene foam (Styrofoam). Plastic bags and stretchy plastic must be bundled together within a single plastic bag for collection. Food soiled paper: Table napkins, paper towels, paper plates, fast food packaging, such as hamburger wrappers, french fry boxes, paper bags, etc. Collection of one bag of waste is included in your monthly utilities waste management fee Up to three additional bags can be set out for collection, however they must have a $3 excess waste tag attached. Visit airdrie.ca for locations to purchase these. Recycling and organics recycling programs are now available at over 120 stations throughout Airdrie, in City facilities, parks and along high traffic pathways. Help us keep Airdrie clean by placing your organics, mixed recycling, beverage containers and garbage in the correct bins. Placing your waste in the correct bin minimizes contamination. If there is excessive contamination, the bin contents will be sent to the landfill as the material is not hand sorted. The signs on the bins show what goes where. Remember, the beverage container bins are for refundable items only (pop cans, juice boxes, etc.) not coffee cups or fountain drink cups. The City of Airdrie multi-family recycling program has been mandatory since January 2018. If you live in an apartment building, residential condominium complex, or any residential building that does not currently receive City curbside collection services, a recycling program should be in place. Every multi-family property must accept mixed paper, cardboard, plastics #1 – 7 (except Styrofoam), plastic film (shopping bags etc. ), refundable beverage containers (excluding glass) tetrapaks® (juice and soup boxes) and metal (tin food cans, aluminum pie plates). Please note: Pet waste is not accepted in City parks’ organics bins. Pet waste in City parks should be put in the garbage. Music ________ in the Park The park is alive with the sound of music! Join us every other Thursday evening starting July 4 at Nose Creek Park at the beautiful new amphitheatre for some amazing toe tapping tunes fun for all ages. Mark your calendars: July 4, July 18, Aug 1, Aug 15 and Aug 29 from 7 to 9 p.m. Check out www.airdrie.ca/musicinthepark for updates! Do it all through one account. Register for programs at Genesis Place. Sign up to receive emergency and other helpful notifications. Pay your animal or business licence fees, bylaw tickets, utility bills and property taxes. Print your tax statements or assessment notice. The options are endless. Stay up-to-date on monthly City news, upcoming events and specific facility information coming directly from City of Airdrie departments, Genesis Place and the Bert Church LIVE Theatre! Airdrie's guide to recreation, events and culture.